1.Equip 3 sets “head of rubber roller”, which is able to adjust the degree from 0-180. 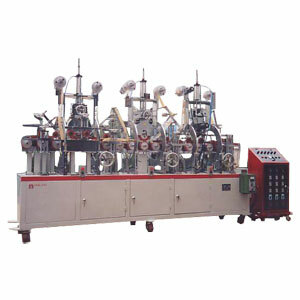 This machine is capable to make a continually production. 3.The sustain shaft equip with the iron wheel, it’s easy to make a replacement. 4.Inside the sustain shaft, we equip the gear wheel, in order to help the printing become more steady. 5.Equip the air cooling system. 6.This model has guide table in the front, and connection table. 7.The entire electric component is imported from Taiwan.